Bunny? I think so! I just couldn’t resist pulling this one out! I colored the stamped image with Copic markers. I layered the image on top of the lacy flower die-cut. The Cat’s Pajamas Tuesday Challenge #310 – Bunnies challenge is nearly complete, but here is an honorary bunny! Enjoy your day. This card features a stamp I’ve had for quite a while. The wood-mount stamp is dated 2006. My how that 10 years flew by! 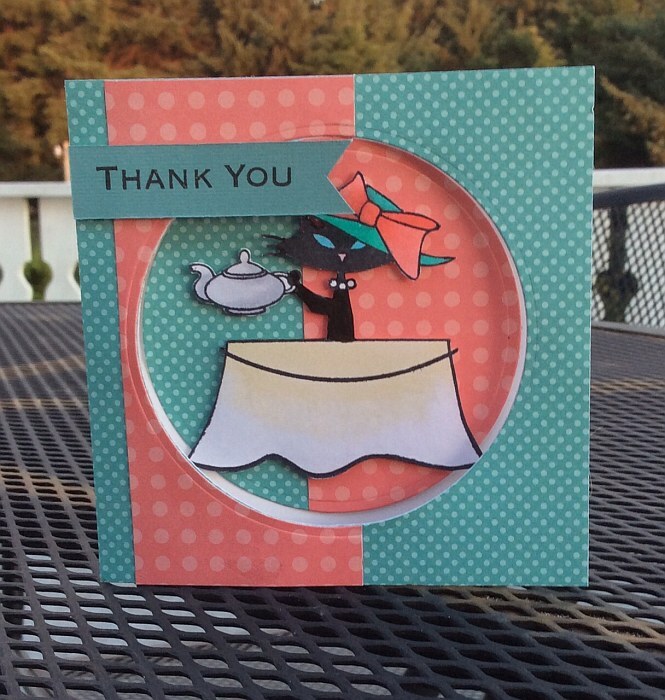 I layered some patterned papers to give the kitty a festive environment, and even used a tiny bit to paper piece the umbrella Miss Kitty is holding. There are some Spring heart showers descending from the cloud, appropriate for the TCP Tuesday Challenge #309: Spring. I stamped the cloud with my sentiment (also from TCP) and adhered it with some dimensional adhesive. As a finishing touch, I added the die-cut bow which turns out so great when you fold it! It also repeats the stitching seen on the cloud to help tie the elements together. Finally, I popped on three little epoxy dots and it was done. Thanks for stopping by. I colored the bunny image with Zig Clean Color markers and did some watercoloring with the ink using a water brush. I created the background using the stencil over Distress Ink and spritzed with water to create a subtle pattern. I added some sparkly gems in the center of the snowflakes. Thanks for stopping by! I’m still making a few New Year’s cards. I have not had a very good week for creative accomplishment, so it is sort of relaxing now to make some new cards. The “real” job is really getting in the way! But it does pay for the craft supplies! 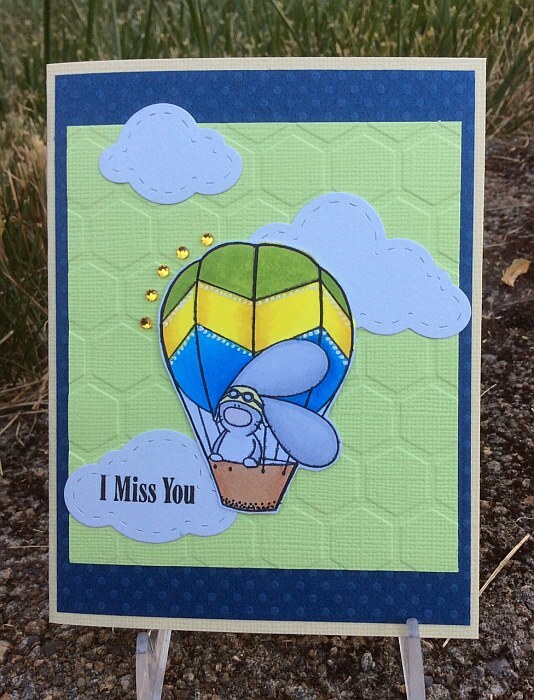 I used a sketch from Freshly Made Sketches as inspiration for this card: Freshly Made Sketches #217. I used stamps from The Cat’s Pajamas for both the kitty image and the sentiment. Wishing you a very Happy 2016! 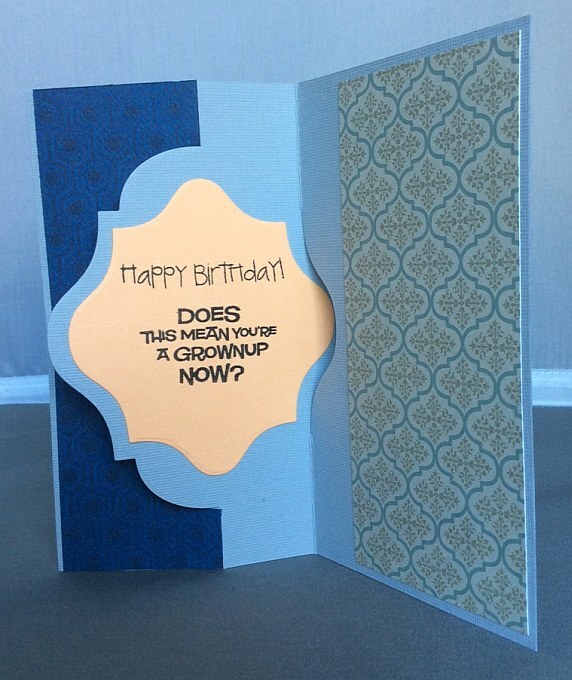 This simple card is a tri-fold window card. I used the The Cat’s Pajamas Tuesday Sketch #294 for design inspiration. I colored the kitty image from The Cat’s Pajamas with Copic markers and popped it up with dimensional adhesive. I used a color blocking technique with the papers for some visual interest. Thanks for visiting today. Does this mean you’re a grown-up now? I had not created a flip card like this before. I used The Cat’s Pajamas dies to make it, which made it a simpler process (they also have a video on their site with a demo on how to make a flip card with this die set). 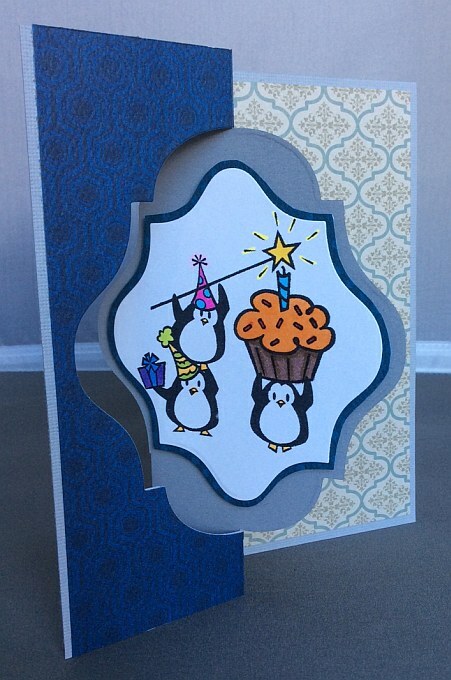 The penguins are on the outside of the card and when you flip that portion, you can see the sentiment (below). I colored the penguins with Copic markers. We gave this to my brother-in-law for his birthday. Thanks for stopping by today.